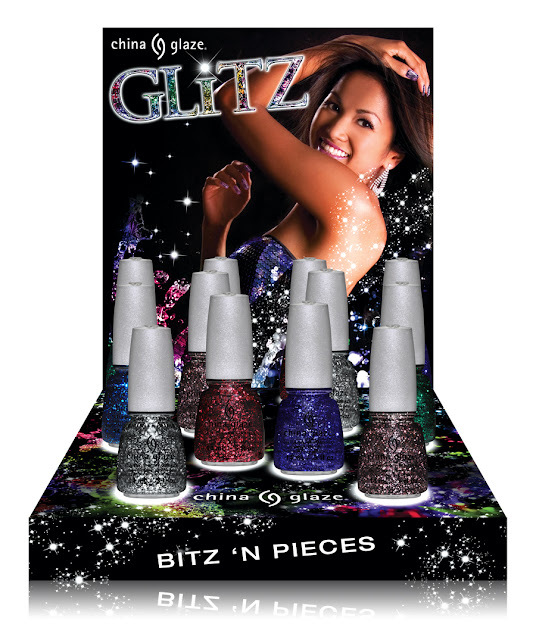 Los Angeles, CA – (November 2012): Razzle Me, Dazzle Me with China Glaze®’s newest generation of chunky glitters, Glitz—Bitz ’N Pieces. Gorgeous 3D glitters, combined with black Bitz ’N Pieces create a Mosaic Masterpiece on nails. Get the perfect Scattered & Tatteredlook for any occasion, and show that edgy side. Heads will surely turn asGlitz ’N Pieces entice bystanders. So, Bling it Onthis winter, and add a little Graffiti Glitter to those nails. TheChina Glaze® Glitz—Bitz ’N Pieces collection will be available in February 2013 at fine salons and beauty supply stores nationwide. China Glaze nail lacquers are available through salons and professional beauty supply stores nationwide. For more information, please visit www.chinaglaze.comor follow China Glaze on Facebook (@ChinaGlaze), Twitter (@ChinaGlazeOfficial) and Pinterest (pinterest.com/chinaglaze). The first blue is amazing! This is very interesting indeed! Are these shreds? I can't really tell what they mean by "Bitz and Pieces" but they look pretty! Can't wait to see swatches of these! They look gorgeous! I'm curious to know what the 3D glitter is? Is it like the new OPI "sand" polish? Hmm, will have to wait for swatches! interesting! They look awesome, but i'm curious to see some swatches. These could potentially be VERY cool! The bottle shot doesn't show a whole lot, so we'll see. Can't wait for that emerald! Color of 2013! So excited for these! I love anything that sparkles. I sure would have rather seen these released for holiday and not held until next yr. I am not typically a big fan of chunky glitters but of late with Essie Stroke of Brilliance I am warming up more to them than in the past. A few here interest me but so hard to tell from the bottle graphics. I always need to wait at least for a few early reviews or real bottle photos. Nice to see ChG coming out with even more collections it seems vs. what has been kind of their standard timed releases through out the yr - they are pushing out more ltd collections now.